On March 29, The University of Alabama Department of History hosted a pair of events lead by two military historians. Executive Director of the US Army Center of Military History and Chief of History, Charles R. Bowery, Jr., and Professor of Military History and Department Head of the War Studies Department at the Marine Corps Command and Staff College, Dr. Christopher Stowe. Bowery and Stowe gave joint presentations to faculty, undergraduate, and graduate students, discussing the Civil War and its relation to today’s military. Attendees of the talk learned about the Civil War’s contested memory, the controversy over naming Federal military bases, and the uses of history for military professionals. 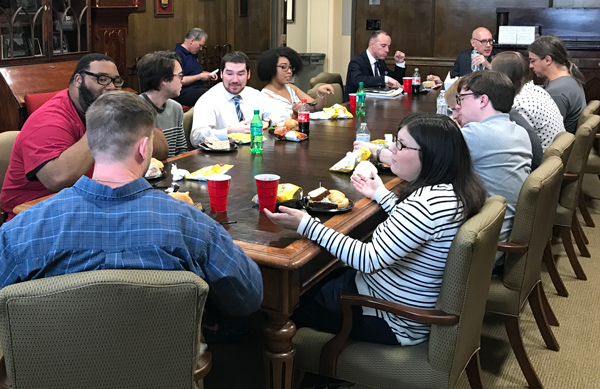 Dr. Stowe and Mr. Bowery joined us again the following day for an informal lunch talk with several graduate students and a few members of our faculty. 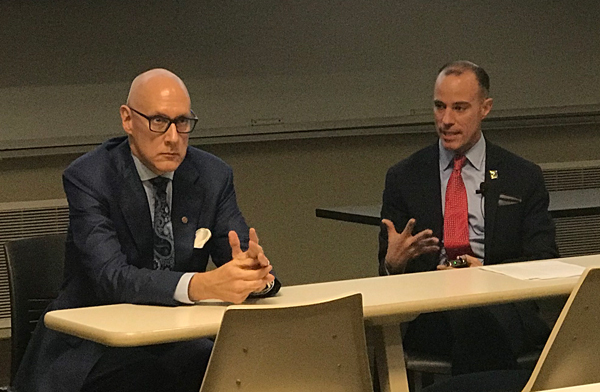 Dr. Stowe and Mr. Bowery specifically addressed graduate students who may be interested in pursuing careers in teaching military history and opportunities the federal government offers to history majors. The speakers also gave students valuable advice on the federal application and hiring process, keys to a successful career as a military historian, as well as important instruction on making academic connections and presentation of one’s skill set in conferences and on the job market. Thank you to Dr. Stowe and Mr. Bowery for visiting The University of Alabama Department of History and all those who attended. A special thanks to Dr. Lesley J. Gordon, Charles G. Summersell Chair of Southern History, for sponsoring the event, and Christina Kircharr for helping to arranging their visit.